A man stands barefoot above piles of raw hides arriving at the tanning factory where he works in the Hazaribagh neighborhood of Dhaka, Bangladesh. He tends to the hides to prepare them for the tanning process, which means they must be soaked in a solution of lime and sodium sulfide to remove hair, fat, and other biological materials still remaining from the animal. He uses long metal forceps to grip, stir, and turn, each piece of raw hide as the corrosive soup splashes and drips directly onto the floor where he is standing. At a factory near Vellore, India, workers are covered in “wet blue,” a mixture of chromium salts and water, protected only with plastic sheeting secured around their waste as they tend to hides. We get inside, take the hides with our hands and throw them outside the pit. We wear gloves and boots but water splashes on our skin and clothes. We don’t wear an apron. The water in the pits has acid, which burns when it touches my skin. 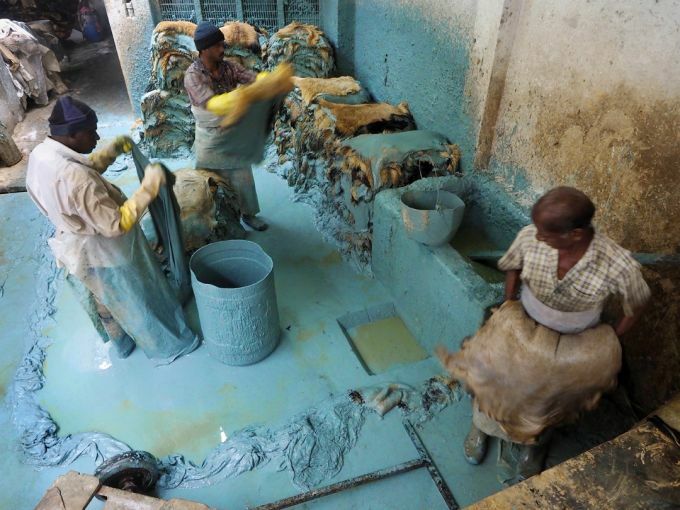 I saw these images as I looked through photos of tannery workers in Bangladesh and India. Despite continued modernization and improvements of factory practices within the fashion industry overall, leather remains a toxic and dangerous business for people and the planet. Various caustic chemicals, many of which are known to be hazardous to human health and the environment, most notably chromium salts, are used at different stages throughout the leather tanning process. Discharges of toxic effluents poisons waterways, rendering them useless for fishing or drinking, which has severe and adverse consequences of the people who live in communities surrounding them. The Buriganga River in Hazaribagh, polluted by effluent from leather tanneries. Image Credit: Daniel Lanteigne. India is the world’s second largest producer of leather goods. Sadly, research within their industry shows that environmental transgressions, human rights violations, and work place accidents abound. Yet, even as conversations about ethical and sustainable living and fashion become more mainstream, there is a lot that the average consumer doesn’t know, or is misinformed about, particularly as it relates to conventional leather versus vegan leather. And sure, these conversations are happening within the sustainable fashion communities and among knowledgeable consumers, but an individual who might just be beginning to consider the environmental and social impacts of her fashion purchases is not yet privy to them. Most glaringly, the concept of vegan fashion is often missing from these important conversations on sustainability within the industry and I think I know why. As veganism becomes more conventional, fast fashion and other mainstream brands have cleverly branded their shoes and accessories as “vegan leather.” Most of these products are made from PVC or PU based plastics and eco-friendly they are most definitely not. Plastic has become a villain of sorts these days, and for good reason: plastic pollution accounts for a staggering amount of pollution and trash found all over the world. In fact, on some beaches on the Big Island of Hawaii, up to 15% of the sand is actually grains of microplastic. If plastic were an invasive species it would be hunted into oblivion. And while the problems with plastics are well known and understood, it’s frustrating that the conventional leather products widely used in fashion are not maligned in the same way. Revered by consumers as the pinnacle of fashion and function, conventional leather is durable and hard wearing, yet versatile in shape and form. From the highest of high fashion houses, to your run-of-the-mill department store brands, one can find leather goods priced to suit almost any budget. Unfortunately, most people don’t know the extent of damage it does to people and our planet. This gap in the conversation causes a lot of confusion to consumers who begin to associate the term “vegan leather” with poor quality and poor environmental standards. It’s no surprise that those same consumers might scoff at the notion that there are plenty of ethical, sustainable, quality brands producing footwear, handbags, and other accessories made from vegan friendly materials that look just as beautiful and perform just as well as conventional leather, but without all the terrible environmental costs and without ever having to harm an animal. One of these brands is Los Angeles based Nicora Shoes, and they take their ethics and sustainability very seriously. I’ve been a long time admirer of Nicora Shoes, from my first pair of vegan leather heels years ago, I fell in love with their vintage inspired aesthetic, but I mostly appreciated their commitments to transparency in their supply chain. At the helm is Stephanie Nicora, founder and 3rd generation shoemaker, leading the way as an innovator in the vegan fashion space. They’ve developed their own vegan leather, which they call Kind Leather, and it meets all three pillars of their supply chain standards: animal ethics, human ethics, and ecology. In fact, they have an entire page on their website where customers can learn about their their standards, as well as environmental impacts of each pair of shoes. For example, according to the fact sheet each pair reduces energy usage by 11,0558 kwt hours. This is the amount of energy required to make one traditional pair of leather shoes. Made from plant waste and recycled materials, Kind Leather is repairable or recyclable at end of life. This is in stark contrast to many products on the market labeled as “vegan leather,” which cannot be repaired and end up in landfills. Made without PVC or plastic grade PU, this material is completely free of animal products and products that test on animals. I love that as a woman owned brand, Nicora supports female workers; all of their shoes are made by an all female team in Minnesota. Nicora generously gifted me a pair of their Angela platforms in saddle, which I’m wearing in all of the photos. It is made from Kind Leather and features a gorgeous cocoa wood heel, which is one of the aspects of this shoe that I think makes it so unique, and sets it apart from other clogs on the market. As someone who doesn’t generally wear heels, I find them to be comfortable enough for regular wear. 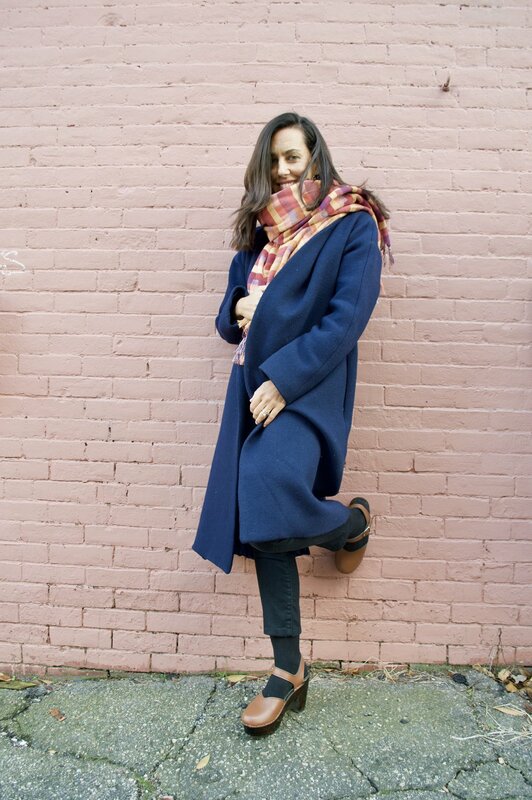 I wasn’t always one to wear socks with shoes more suited for warmer weather, but as I make continual efforts to reduce the environmental impact of my own personal wardrobe, I’ve realized that curating a seasonless wardrobe is a great way to do that. I’m about to relocate to California where the weather is pretty much the same all year, I’m born in raised in the Northeast where the weather can change in the blink of an eye. We have hot, humid summers, and bitterly cold, snowy winters. It’s a bit of a challenge to have a truly seasonless wardrobe when you live in this type of climate - but it’s not as impossible as it may seem. And although I’ve never been one to overtly embrace a true capsule wardrobe, I suppose that the seasonless wardrobe is, in a sense, just that: a number of staple pieces to wear year round, with specialty and seasonally appropriate items added in when needed. I wear the same denim jeans, tees, tanks, and light weight button-down shirts year-round, and layer them with heavier sweaters and jackets in the winter time. I have a few beloved tea to maxi length skirts (most of which I found second hand) that look equally as cute with a bodysuit and sandals in the warmer months, or layered with tights, a chunky sweater, and boots in the colder one’s. In the hotter months I do filter in some light-weight summer dresses. My summer sandals, of course, aren’t worn in the winter months, but I’ve been embracing the notion of wearing summery strappy heels with cute socks or tights. 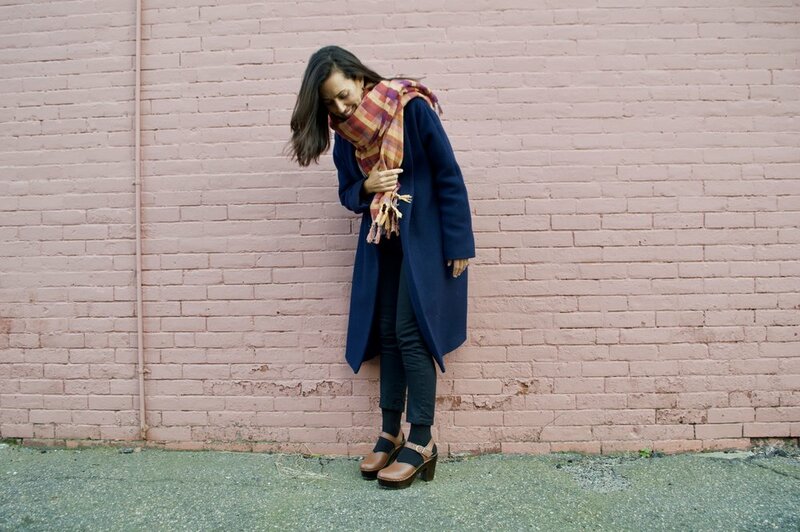 Curating a wardrobe in this way ensures that you have a functional wardrobe year round. It also means that you’re making the most of what you have and are less prone to impulse purchases, or buying things you don’t need. It might seem challenging initially, but I’ve found that dressing in this way has allowed me to discover my personal style and what I’m most comfortable in day-to-day. If you’re not accustomed to shopping second hand, you might be surprised by the quality and variety of clothes you can find. From high-end vintage shops, to low cost super stores, buying secondhand is not only fun, it’s often less expensive than buying new, and gives garments that would otherwise be destined for the landfill a new lease on life. If you’re investing in good quality clothes, they should last a while, but at some point everything will show its wear. When possible, mend and repair your clothes. These days, many sustainable brands are offering repairs on their products. In fact, Nicora Shoes offers the only sustainable and vegan shoe repair in the United States; simply select boot or shoe repair from the options on their website, and send your shoes back. I’ve had some great luck with a local consignment shop over the years, but also recommend sites like Poshmark and Depop. Your community might have a textile recycling program - search for one near you here. Or, you could consult this great list from Trash is For Tossers, which provides a number of textile recycling programs.